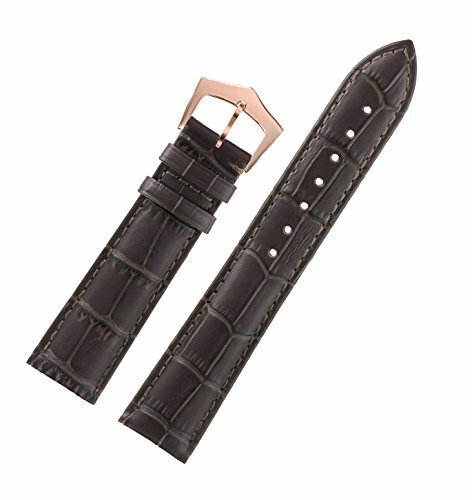 Dark Brown genuine leather watch bracelet with accentuated tone-on-tone stitch, decent rectangular scales, and rose gold pin buckle attachment of stainless steel. Length: 75mm+119mm. Height: average 4mm. Width: 17mm. buckle width: 16mm. Only the best and high-grade materials were selected and processed under strict quality controls. We use full grain Italian calfskin for this strap which owns its silky shine through matte finish. Moderate padding and premium leather provide maximum comfort and style. Special treatment joins upper and lining leather seamlessly and ensures a high level. This watch band meets many physical requirements, such as tensile strength, suppleness, color fastness and resistance to sweat, all of which guarantee its longevity. Since our watch strap is water resistant, please keep it away from water during bath and swimming. These watch straps are available in several colors and designs: black leather with black stitch, black leather with white stitch, brown leather brown stitch, brown leather with white stitch, dark brown leather with dark brown stitch, dark brown leather with white stitch. And buckles of four different colors also available for your desired look, silver, black, gold, rose gold. It's specially designed and made for your luxury watches. It can be applied to watches with standard straight lug ends, such as Tissot, Longines, IWC, Rolex, Mido, Omega, Armani, Cartier, Tudor, Movado, Rado, Hamilton, Titoni, Certina, Calvin Klein, Swiss Military, MontBlanc, Girard-Perregaux, Carl F.Bucherer, Armani, Kronsegler, Jaeger, Invicta, Zenith, Ranceas, Timex, DAVOSA, Oris, etc. By GC Gelfand & Co.